If Bangla literature has a counterpart to Sherlock Holmes, then it is undoubtedly Feluda. Written by Satyajit Ray, who was an avid fan of Doyle’s writing, Feluda’s exploits has made him the most popular detective in the Bangla speaking world. In this adventure, Feluda’s investigation into a mysterious death takes him and his companions to Kathmandu, Nepal. The story is a little different from most of Feluda’s other adventures, as the investigation takes an unexpected turn after the appearance of ‘an old friend’. In today’s Bangladesh, the terms ‘Science Fiction’ and ‘Zafar Iqbal’ are effectively synonymous. In this story, he narrates how a scientist gets into big trouble due to a robot’s logic. At an inventor’s conference in Baghdad, Professor Shanku meets a mysterious Hassan Al Habbal, who claims that the Arabian Nights were not all written from imagination. While most do not take him seriously at first, it soon becomes evident to Shanku that Al Habbal’s claims were not far from the truth. A few teasers: Sim Sim, Ur, Ziggurat, funeral. Enjoy! Another change, this time, in the form of a poem that I feel every Bangalee must know by heart. 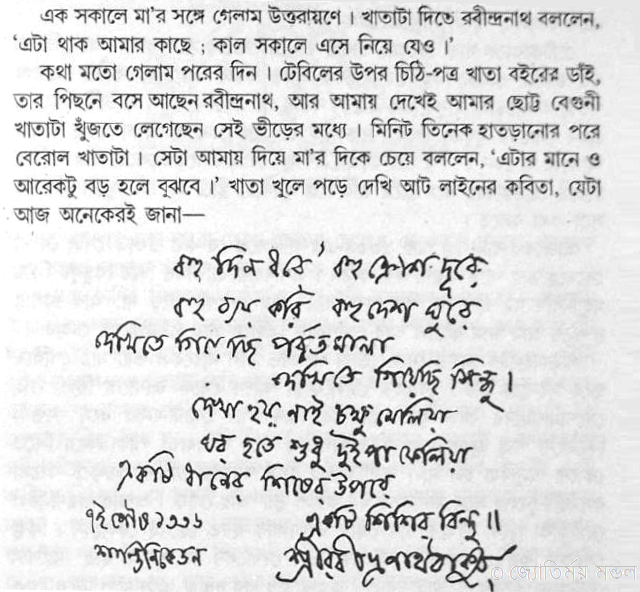 Written by Rabindranath Thakur, the poem is beautiful enough in its own meaning, but it is also significant for another reason – the poem was written as an autograph for a young boy by the name of Satyajit Ray, who would go on to become one of the greatest movie directors in history and one of Bangla’s greatest cultural figures. I’ve gone to see the mountains, the oceans I’ve been to view. On a sheaf of paddy grain, a glistening drop of dew. A little variation this time, with a story from Banaful. In Train e, an unabashed youth and contemptuous older man size each other up during a chance meeting in a train compartment… with amusing consequences. Of the writers who have written science fiction in Bangla, Satyajit Ray deserves a special mention. Frequently, and particularly when it comes to more recent writings of the genre, Bangla science fiction stories come loaded with scientific jargon and complexities, but Ray’s stories are exceptions in this regard. With their science kept light but firm, and beautifully complemented with imagination, the stories occur around characters who are uncannily familiar, like the middle-aged bachelor next door or the schoolboy who is bad at Math. And perhaps that is why the stories captivate the reader so much. Brihachchanchu is fittingly the first of the many science fictions of Satyajit Ray that you will find on this site. A gripping story about a strange creature that is adopted as a pet by a stoic but sharp Kolkatan, it holds something for even those who are averse to science. If you are at the other end of the spectrum, and know a little paleontology, here is one word for you: Andalgalornis. Enjoy! The first upload of Professor Shanku’s stories on this site: for the uninitiated, Professor Shanku, a creation of Satyajit Ray, is a Bangalee scientist who is well-known for his inventions and adventures across the world. In this story, however, Shanku’s genius comes to be of little value when he is stumped after meeting an unnervingly talented and knowledgeable child.